All the above and other features such as Parental Control, Electronic Programming Guide for24 hours in advance, Signal Quality Indicator, Closed Captioning are there in a fully functional remote control. 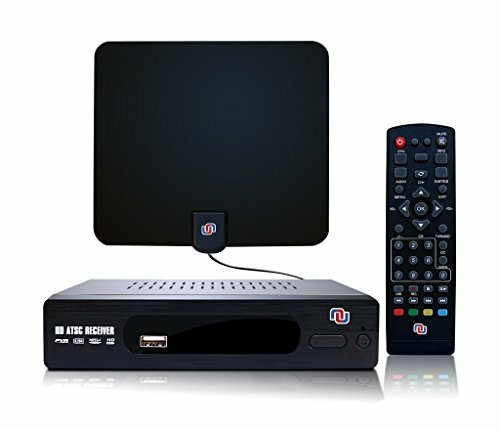 ♡WATCH FREE DIGITAL CHANNELS on the go- On your HDTV, 4K TV, LCD monitor, LED, projector etc. - With paper-thin antenna and TV converter box, you get multiple output: HDMI, composite, coaxial and RCA - With the LCD screen you will always know what channel you are on. You can go to antennaweb.org and type in your zip code to check the availability of those popular channels (such as ABC, CBS, PBS etc.) near your location. ♡MULTI LANGUAGE MENU: Confirm to auto or manually scan all available TV channels. Find multi-language channels,subtitle and audio output for tourists. ♡DAILY or WEEKLY RECORD: Get to leave in the middle of your program? Just Push RECORD/PAUSE - Not going to be home to watch your favorite show? Just SCHEDULE it with "Daily", "Once" or "Weekly" mode for recording to an external hard drive. ♡HD ANTENNA+AMPLIFIER: Paper-thin 35 miles Antenna with 10 ft Premium Cables receives up to 120 OTA channels from stations up to 50 miles away with amplifier included. If you have any questions about this product by Voion, contact us by completing and submitting the form below. If you are looking for a specif part number, please include it with your message.